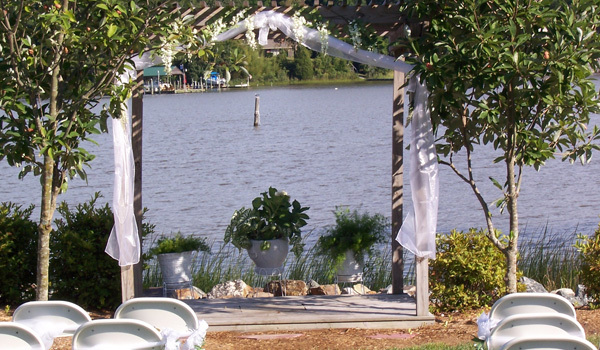 When you’re searching for wedding venues in Newport News, VA, our full-service marina can be the perfect option to celebrate your big day. Deep Creek Landing isn’t just a boat yard and fuel dock, but our venue also has stunning banquet facilities that can be a perfect fit to your spring or summertime wedding. Our waterfront wedding venue has been rated one of the top places to host a wedding in the area and all of our exceptional staff will do their best to make your big day special. Our indoor facility contains a gorgeous reception room along with a full-service kitchen, so you and your guests will be served only the finest quality food. We have a beautiful lawn and deck area that can perfectly accommodate an outdoor reception or ceremony. Our entire facility can hold up to 120 people on your guest list. By having your wedding at our full-service marina, your guests won’t have to go far between their rooms, to the ceremony, and then finally the reception. All of our cabins come equipped with clean restrooms and showers, laundry services, and picnic areas so you and your wedding party can have a relaxing weekend surrounding your big day. For more information on one of the best wedding venues in Newport News, VA, contact Deep Creek Landing at (757) 877-9555 today! This entry was posted in Uncategorized and tagged wedding venues Newport News VA on January 26, 2017 .